The winter time can be harsh on your skin, and it's time to replenish that dry skin! 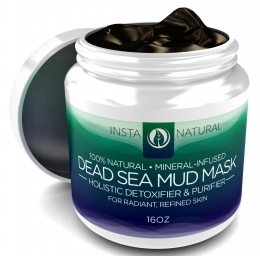 This Dead Sea Mud Mask by InstaNatural is great! I had a lot of fun with it too, I made it into a "spa night" at my house. Nice and relaxing. It's an all natural detoxifier and purifier that comes from the dead sea. It absorbs excess dirt and oil from your skin & helps with acne. Perfect for those annoying blackheads too! If you use it as a body treatment, it is good for this aching muscles. I have not tried this yet, but it sounds wonderful. I only used it on my face so far. What fun way to have your girlfriends over and create a "spa night" at your house!! !